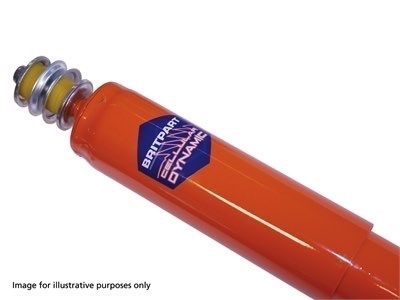 A highly advanced foam design shock absorber!<br> <br> The Britpart Cellular Dynamic Shock Absorber represents a significant advance in Land Rover suspension systems.It features a cellular foam insert instead of a normal nitrogen gas or air, this is to stop the oil from boiling. The foam takes up less room which means more room for oil, 50% more, which offers maximum heat dispersion.<br> <br> This heat dispersion translates to a very subtle but controlled ride that will not fade no matter how hard you push them. They are ideal for a driver who needs more control to complement performance improvements or to enhance a standard vehicle. The unique design ensures ride comfort and cornering ability is maximised and of course they are superb off-road. A highly advanced foam design shock absorber! The Britpart Cellular Dynamic Shock Absorber represents a significant advance in Land Rover suspension systems.It features a cellular foam insert instead of a normal nitrogen gas or air, this is to stop the oil from boiling. The foam takes up less room which means more room for oil, 50% more, which offers maximum heat dispersion.